I have a 250 gram beef brisket stored inside the freezer. We bought it last Sunday for 5,000 KRW ($5) to be cooked as “changjorim,” a korean meat side dish made with soy sauce, sugar and ginger. We forgot to buy ginger so I haven’t touched the meat until now. So this afternoon I went to the neighborhood grocery but their ginger all looked dry. I thought that instead of cooking changjorim, I’ll just cook the beef with the beef sinigang mix my mother brought when she visited us. So I bought a bunch of shigumchi (spinach- 1,400 KRW), tomato (300 KRW) and kaji (eggplant – 2 for 500 KRW). 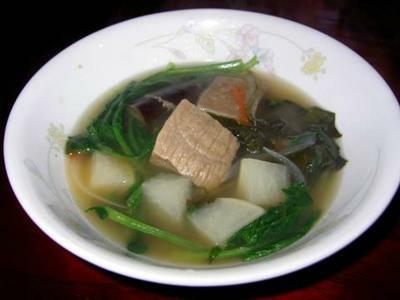 Minari (chinese watercress) is more appropriate for sinigang but it wasn’t available. The nice thing about sinigang is that it’s so easy to cook. I just boiled the beef until tender. And added the beef sinigang mix plus all the vegetables (onion, tomato, eggplant, spinach, radish). It was good even if the spinach was a bit overcooked. I didn’t even wait for my husband to come home… so I ate alone and unfortunately, I ate about two cups of rice! Hay! Quite interesting, It was hard to find the right ingredients while in S. korea. I was able to get some through my parents. My wife (ex now) loved it, added some green onions and used ox tail instead. ANO!! KrW5000/250grams eh di P1,000/Kilo ang MAHAL!!! Kaya pala puro mga payatot mga Koreano lalo na yung classmate ko si Jeves ( thats his English name ) Park.. Not Enuf Vitamins hahahaha..
I’M ALSO ONE OF THOSE WHO DON’T KNOW HOW TO COOK. GOOD THING I FIND THIS SINIGANG NA BEEF. aND ONLY NOW TO KNOW THAT IT’S GOOD TO ADD SPINACH OR MINARI IN SINIGGANG. I’LL TRY ALSO. MY HUSBAND IS A GOOD COOK BUT I NEVER LEARN COZ I ONLY WANT TO EAT. NOW THAT WE HAVE KIDS IT’S HARD TO FEED THE KIDS WITH OUT VIANDS. SOMETIMES I ONLY ROLE THE RICE IN THE DRIED LAVER (KIM) NOW I REALIZE THAT IT’S VERY IMPORTANT TO KNOW HOW TO COOK FOR THE SAKE OF THE CHILDREN AND OFCOURSE EAT AND ENJOY THE DELICIOUS FOOD.